The one-hub-per-tunnel rule works well in small and medium-sized DMVPN deployments, but you can’t use it in large-scale (Phase 3) deployments with hierarchical hub structure as NHRP shortcuts between subnets never got properly implemented in the DMVPN code. In these cases, you’re forced to have multiple hubs in the same DMVPN subnet. While developing the material for the DMVPN New Features webinar, I tested the convergence of both designs and found out significant differences in a hub failure scenario (convergence after a spoke failure depends purely on the routing protocol settings). Spokes send all the inter-spoke traffic through the hub until they manage to establish direct IPsec session. A hub failure can thus directly impact spoke-to-spoke connectivity in those DMVPN networks where spokes can’t establish direct IPsec sessions (due to NAT or other limitations). When you lose a hub router in one-hub-per-tunnel DMVPN design, NHRP registrations on the tunnel fail completely and the routing across the affected tunnel stops after the spoke routers figure out their routing protocol neighbor is gone. If you use short NHRP registration timer (configured with ip nhrp registration timeout), NHRP detects the hub failure pretty quickly (spoke routers need at most NHRP registration timer + 10 seconds to detect the failure; details are described in my DMVPN New Features webinar). If you combine 10 second NHRP timers with interface state tracking (configured with if-state nhrp), the spokes stop using the failed tunnel in less than 20 seconds. 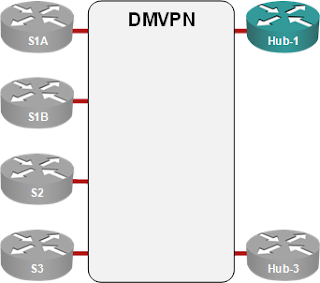 Losing a hub in multi-hub DMVPN design will not affect the routing across the DMVPN tunnel. Spokes will eventually detect one of their routing protocol neighbors is gone, but the change will not affect their routing tables. NHRP spokes usually use a single hub router for NHRP resolution and interim inter-spoke traffic (until a spoke-to-spoke session is established); the spoke-to-spoke traffic could also flow over the hub router indefinitely if you have the spoke routers behind a too-restrictive NAT device (yet again, you’ll find all the details in my DMVPN New Features webinar). Failure of the “selected” hub router could thus also disrupt the spoke-to-spoke traffic. The disruption period depends on IOS release. IOS releases prior to NAT enhancements. The spokes detect hub router failure through NHRP registration timeouts (see above). Spoke-to-spoke traffic flows through the hub only if the NRHP entry for the other spoke is incomplete or otherwise faulty (for example, IPsec session is not operational, resulting in no socket state) and is not tied to any individual hub. As soon as the spoke detects the failure of its currently selected hub router, it switches to another hub router, resulting in short disruption of inter-spoke traffic. IOS releases after NAT enhancements (12.4T and 15.x). Spoke routers create fake NHRP entries for other spokes using the hub’s router NBMA address. The fake entry disappears as soon as the spoke router receives a NHRP reply from the other spoke, but could stay in the NHRP cache indefinitely if the spoke-to-spoke IPsec session cannot be established. These entries are tied to specific NBMA address (of the selected hub router), not to the hub router and do not disappear when the spoke router discovers hub router failure (via NHRP registration failure). To make matters worse, the fake entries use a 3-minute expiration timer that cannot be adjusted with any publicly available DMVPN configuration command that I could find. A hub router failure can thus disrupt the spoke-to-spoke traffic for up to three minutes (until the fake NHRP entry expires). To learn more about DMVPN design and deployment issues watch the recording of my DMVPN: From Basics to Scalable Networks webinar and register for the DMVPN New Features webinar. You can get access to both webinars as part of the yearly subscription package. You should also consider our professional services team if you need expert help in DMVPN network design or deployment. It's hard to guess what's causing the outage in your case, but if you have a single router on the spoke site(s), definitely make it an EIGRP stub router. The case of two routers on stub sites is a bit more complex (example:you need a leak route-map if you have loopbacks on the routers), a sample configuration is included with my DMVPN webinar. Thanks Ivan. I am using leak maps for my sites, but i am know going to make all of those stubs to see if that helps. I was wondering if you are going to publish any cisco press on DMVPN, I have your MPLS and VPN Architectures I and II. I don't plan on writing any new books in the foreseeable future. DMVPN Trilogy (http://www.ipspace.net/DMVPN_trilogy) would be an equivalent to an in-depth DMVPN book (obviously in a different format ;). 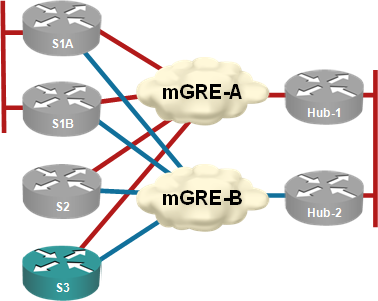 In a dual hub/dual dmvpn design, when using ebgp between the hub and each spoke, if we loose the main hub, it takes so long for the spoke to converge (detect main hub failure and reroute to the second hub) bgp dead interval. The hub has aprox 70 dmvpns, and 100 spokes per dmvpn. What could be the best solution to achieve fast convergence avoiding routing instabilitys and resource (memory cpu) overconsumption? Was thinking in using if-state at the spokes, or tunning bgp timers, or even both. Independent of the solution, what could be the correct values? You could tune BGP timers, use BFD, or IF-State with some really creative routing tricks (IF-state brings down only the remote interface, not the hub BGP session). As for time values, the only correct answer is "it depends" - based on the platform you have and your convergence requirements. I suppose the 10 seconds you mention above ("10 seconds to detect the failure") are actually 7 seconds.